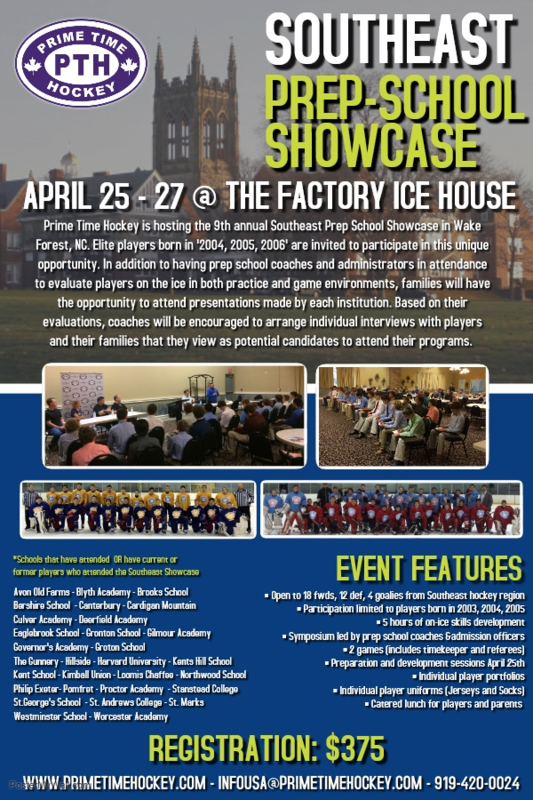 Prime Time Hockey is pleased to be hosting the 9th annual Southeast Prep School Showcase in Wake Forest, NC. PTH is inviting elite hockey players with borth years '2004, 2005 and 2006' from the region to participate in this unique opportunity. In addition to having prep school coaches and administrators in attendance to watch and evaluate players on the ice in both practice and game environments, hockey families will have the opportunity to attend presentations made by each of the educational institutions. Based on their evaluations, coaches will be encouraged to arrange individual interviews with players and their families that they view as potential candidates to attend their programs. • Open to 18 forwards, 12 defenseman, 4 goaltenders from Southeast hockey region. • 5 hours of on-ice skills development. • Work shop and symposium led by prep school coaches & admission officers. • 2 games (includes timekeeper and referees). • Special discounted rate at neighboring hotel for out of town families. 1:15-2:00pm Individual meetings with players, parents, and coaches. Please contact our office to discuss registering and exposing the hockey player in your family to this unique prep school showcase opportunity.